Dense, lightly spiced, and a little too easy to eat, these might be my favorite use yet of spent grain. 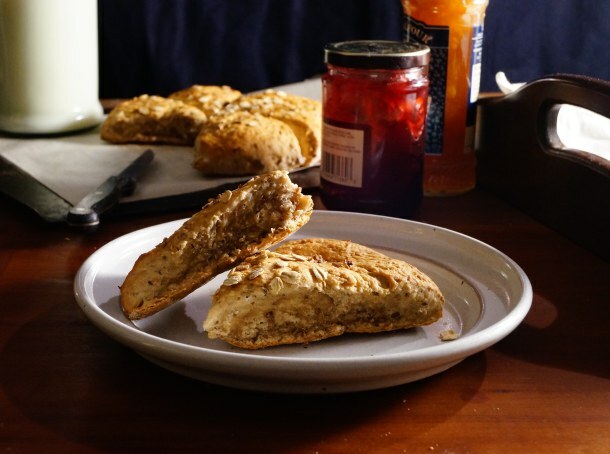 They’re hearty, but the spent grain doesn’t overwhelm the scone, giving it instead a rustic, country-cottage feel. They’re much heftier than my usual batch of currant scones, so I might continue to try and tweak the recipe. As with all these recipes, I encourage you to try playing to find your ideal version. I think this would be wonderful with chopped raisins or dried cranberries, and small pieces of fresh apple certainly wouldn’t go amiss, either. In homage to the origin of the spent grain, I seriously recommend spreading your scones with a good dollop of apple butter. Preheat oven to 350°F. Combine the water, maple syrup, and melted butter. To this, add the spent grain and rolled oats, followed by the cinnamon. While stirring rapidly, add the egg, and mix in thoroughly. Line a baking sheet with parchment paper, and lay aside. In a large bowl, combine the liquids and egg, followed by the oats, spent grains, salt, and cinnamon. Mix together the flour, baking soda, and baking powder, then add gradually into the wet mixture. Turn the dough out onto the prepared baking sheet, then roll or pat into a large disc about 3/4″ tall. Cut into quarters, then into quarters again. Using the knife, slightly separate each triangle. Brush the tops of the triangles with maple syrup, then sprinkle with the rolled oats. Bake 25 to 30 minutes, or until golden brown and firm to the touch. Serve immediately. Definitely making this tomorrow, I even have real Michigan maple syrup made by my daughter and the rest of the MSU Forestry Club. Tried the scones and being of a scone mind and a sort of scone snob I changed just a few things. Instead of water I used buttermilk as the acidity of the milk actually lightens the flour mixture making it less dense. I also added 1 cup of cinnamon chips and baked at 400 degrees as a hot oven will give an oven spring also making the end product lighter. They turned out fabulous. Great maple flavor and even better with English cream and jam. YUM!